With more vehicles in use worldwide than ever before, engine makers are competing to deliver cleaner, more efficient engines at affordable prices. To gain an edge on the competition, California-based small business Pinnacle Engines is laser-focused on a unique engine design. “We’ve been studying more or less the same engine system the entire existence of the company,” said Clayton Naber, lead analysis engineer at Pinnacle Engines. That system—a four-stroke, opposed-piston, sleeve-valve engine—is an internal combustion engine that uses an unconventional mechanical design. “The scientific reason for going after this engine architecture is because there is a greater chance to reduce fuel usage while also achieving as good or better emissions than a conventional engine,” Naber said. To develop the optimal model of this engine, company engineers turned to the high-performance computing resources at the Oak Ridge Leadership Computing Facility (OLCF) located at the US Department of Energy’s (DOE’s) Oak Ridge National Laboratory(ORNL), including the 27-petaflop Titan supercomputer. The OLCF is a DOE Office of Science User Facility. In a conventional reciprocating internal combustion engine, a piston reciprocates, or moves back and forth, in relation to a cylinder head that encloses the top of the combustion chamber. Because the cylinder head has a large surface area, some of the heat released during combustion escapes without producing work. In an opposed-piston engine, two pistons reciprocate in relation to each other instead of a cylinder head. This design reduces heat loss and allows for a much wider range of piston motions that improve efficiency throughout engine operation. Pinnacle Engines’ design also includes a novel, reciprocating sleeve-valve system to handle the exchange of fresh air and exhaust. The timing and motion of the sleeve valves can be controlled to enhance air motion and fuel mixing, which improves combustion and reduces the creation of pollutant emissions. This combination of design features can provide the flexibility needed to optimize engine performance over a wide range of operating conditions. However, it also increases the complexity of the mechanics and thermodynamics involved in combustion, presenting unique operating challenges. For over a decade, Pinnacle Engines has developed opposed-piston engines for a range of small, single-cylinder applications such as motorcycle and industrial generator engines. Even though it is not the only company developing opposed-piston engines, it is among those striving to overcome the engine’s engineering challenges to take advantage of its possibilities. To achieve this vision, Pinnacle Engines wants to build an opposed-piston engine for passenger cars and other light-duty vehicles as it has done for motorcycles. But first, the company’s engineers are analyzing in detail what design choices could improve combustion efficiency and reduce emissions. Applying for access to national lab resources through the DOE Small Business Vouchers program led Pinnacle Engines to a collaboration with the DOE Vehicle Technologies Office and researchers at the National Transportation Research Center (NTRC) at ORNL. The OLCF in turn supported the NTRC–Pinnacle Engines collaboration by providing computing time on Titan. On Titan, the Pinnacle Engines team was able to simulate key design options for a multi-cylinder, 1.2-liter gasoline engine in a short amount of time. To achieve high efficiency and low emissions, their opposed-piston design uses variable valve timing and compression ratio, as well as a gas intake method that creates a “swumble mode”—a combination of swirling and tumbling gas in the combustion chamber. The variable valve timing and compression ratio optimize combustion for different engine speeds and work outputs during engine operation by responsively moving the pistons to adjust the gas compression. The swumble mode reduces fuel usage and emissions at certain operating conditions by improving fuel and air mixing. “The combination of variable compression ratio plus this swumble mode is a unique aspect of the Pinnacle engine,” said Charles Finney, R&D staff member at NTRC. The Pinnacle team worked with Finney and Dean Edwards, NTRC R&D staff member, to prepare the commercial CONVERGE computational fluid dynamics (CFD) software package they were using on Pinnacle’s in-house cluster for Titan’s large-scale architecture. They further collaborated with ORNL and the commercial software developer Convergent Science to adapt CONVERGE’s combustion chemistry models to Pinnacle Engines’ highly dilute combustion environment, which required identifying the most important chemical reactions for simulating their combustion method. Once CONVERGE was optimized for Pinnacle Engines’ technical goals and Titan’s architecture, the team conducted thousands of CFD simulations on Titan and OLCF’s Eos cluster. With these resources, they were able to survey the entire design space in a shorter amount of time than they would have been able to do in-house. The computational time used on OLCF resources amounted to about 6 months, but Naber estimates it would have taken eight times longer in-house. “To do a really good job of characterizing the behavior of the engine through CFD, we would need about 4 years’ worth of raw computational time. On Titan, we were able to compress that down into just a few months’ worth,” he said. Titan simulations revealed the importance of combining the two modes of turbulence into the swumble mode for driving combustion without increasing temperature, which enabled low-temperature combustion with low nitrogen oxide emissions. Simulations of different inlet port designs for air intake into the combustion chamber also informed a design approach that enhanced swumble turbulence. “Before these simulations, we had a partial view and some details about the air motion in the engine and how it affects combustion. But on Titan, we were able to run simulations to see what the flow field looks like at finer resolution and were, therefore, able to better understand it,” Naber said. 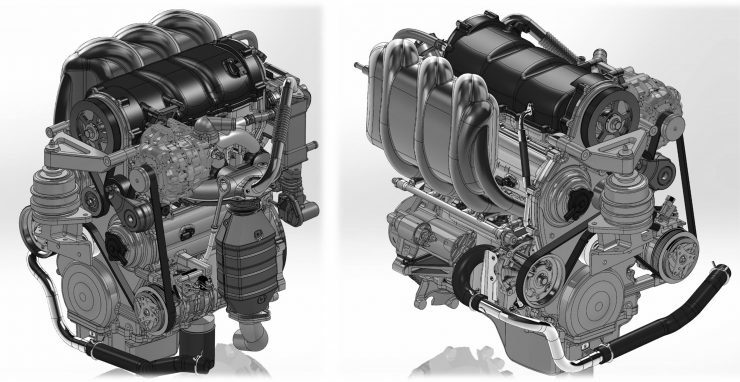 With a firm design concept, the team modeled the entire combustion system over typical operating conditions, known as a drive cycle, to evaluate whether the design could comparably meet emissions and fuel-economy standards of other efficient engines on the market, such as diesel engines. Now, the team is building a prototype engine for experimental testing. “For us, it’s really about commercialization next,” Naber said. Related Publications: Banerjee, C. Naber, M. Willcox, C.E.A. Finney, and K.D. Edwards, “High-Performance Computing and Analysis-Led Development of High Efficiency Dilute Opposed Piston Gasoline Engine.” Journal of Engineering for Gas Turbines and Power 140, no. 10 (June 19, 2018), doi: 10.1115/1.4039845. Mittal, S.D. Wijeyakulasuriya, D. Probst, S. Banerjee, C.E.A. Finney, K.D. Edwards, M. Willcox, and C. Naber, “Multi-dimensional Computational Combustion of Highly Dilute, Premixed Spark-Ignited Opposed-Piston Gasoline Engine Using Direct Chemistry with a New Primary Reference Fuel Mechanism.” Paper presented as part of the Proceedings of the Internal Combustion Engine Fall Technical Conference, Seattle, WA, October 15–18, 2017. ORNL is managed by UT-Battelle, LLC for the Department of Energy’s Office of Science, the single largest supporter of basic research in the physical sciences in the United States. DOE’s Office of Science is working to address some of the most pressing challenges of our time. For more information, please visit http://science.energy.gov/.